This is the ultimate guide to the beautiful game of Darts. In this guide, we'll cover everything from different types of games to advanced strategies for beating your friends. So whether you're a seasoned veteran or just starting out, we're sure you find some new information below. So, without further ado let's get started. If you're already familiar with terminology such as "the 01 games" and how to play cricket, please skip ahead but if you're not totally sure of those, keep reading this chapter. So, without further ado, how do you count scores in darts? Scoring depends on the game, but most of the fundamentals which we are going to teach you will apply to most games you will play. The most popular games are the 01 games and Cricket. If there is one thing you need to know as a dart player, it is how to score. Before we go into this, we can tell you that there are two ways you can do this. You can use your mental arithmetic skills, or you can use a calculator. There is no right and wrong way, as long as you are accurately capturing scores. If you have a cabinet for your dartboard, then you probably have a scoreboard laid out. Use chalk to write in any numbers. If you do not have a scoreboard, a pencil and some paper will do just fine. Leave your darts in the board until your turn has been scored. Do not be afraid to check your (or anybody else’s working). Keep the scoreboard visible for all players. Write the scores clearly and concisely. Use a calculator if your math skills are rusty. Scoring 01 games is easy. All you have to do is subtract your three-dart score from your total score. To start the game, write the starting number at the top of your scoreboard (or sheet of paper). For a 501 game, you would write 501 at the top. This is your starting total. You need to have two columns for each player playing. One column has their total score (starting at 501), and the other will have the score for their turn. We've listed an example of how to score below, with the total score on the left and the round score on the right. When a player takes their turn, tally up the score for the three darts and write it in the turn column. Subtract this from the total score and write the new total score in the score column. Easy as pie. Don’t forget that you need to double out in a 01 game. Try to leave yourself on a double. For example, if you leave yourself on 20, you can go out with double 10. As soon as someone reaches zero by doubling out, they win the game. Now, I know that I said that you should mark your score at the end of your turn, but you should also be keeping track of your score as you throw each dart. This is important for two reasons. The first reason is so that you know when you have left yourself on a double and you can throw at that double. The second is to stop yourself from busting out. If at any time during your turn you leave yourself on 1 point or less, then you have busted out. You cannot double out if you leave yourself on 1, and you certainly cannot double out if you leave yourself on less than one. If you bust out at any time, your turn is over, and your score reverts to what it was at the start of your turn. Cricket scores a little differently to the 01 games. If you have a dart scoreboard, then you probably have a cricket scoreboard set up. If you do not, it is easy to do so. Cricket scores with the numbers: 20, 19, 18, 17, 16, 15, and the bull. Take a sheet of paper and write these numbers in a column down the middle. Mark two columns on either side for each player or each team. Hitting a number three times closes that number. When a team hits one of the numbers, mark a slash beside that number. When they hit it a second time, mark an opposite slash to form an ‘x.’ When they hit it a third time, circle the x. The number is now closed. When a number is closed, a team can score on it until the other team also closes it. When a team scores on a closed number, mark that score down on the outside column for each team. Add additional scores to keep a running total. You need to keep score if you want to play darts. Practicing your mental arithmetic is a great way to improve your brain function and get to know which numbers you need to hit to score out. Okay, here’s the deal. Darts is fun, right? But what could be more fun than rules? Am I right? Raise your hand if you don't think rules are FUN! Ahem, anyway, there are some darts rules which you need to follow. Not only to keep you in line with other players but also to allow you to play the game as it is supposed to be played, and that will make the game more fun. I assure you. You probably know some of the basic rules, but there are probably some rules of which you are not aware. I am going to cover everything you need to ensure that you never put a foot wrong. In no particular order, here are the dart rules you must know. Every player gets 3 darts per turn. Unless the game states otherwise, 3 darts per turn is standard. No more, no less. When in doubt: 3 darts per turn. Remove your own darts. Don’t be lazy. If you threw them, you need to go get them. This also ensures that your opponent does not change your score. Remember the fallen. More specifically, remember that fallen darts are scored as zero. 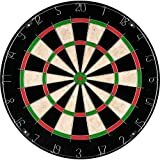 If a dart bounces out, does not make the board, or misses the board completely, it scores zero. Once you have thrown a dart, you cannot re-throw it. If you ‘drop it like it’s hot,’ then you can pick it up and throw it. A thrown dart cannot be thrown again, but a dropped dart can be thrown. Don’t cross the line. The throwing line has been measured and marked. Stand with your foot on or behind it, but do not cross the line when throwing. Score your darts before you remove them. People make mistakes. How many times have I forgotten my score after removing my darts? So many that it is embarrassing. Check your score, mark your score, and then remove your darts. Once you have thrown your darts, do not touch them until the end of your turn. You can throw one and then go examine its position, but you cannot touch any thrown dart until your turn is over. Throw all three, score all three, remove all three. Don’t be a “insert your word of choice here”. Darts is fun and civil. Respect your opponent and respect everyone else involved. Shake hands before and after a match. Remind yourself that you are going to get lucky and unlucky. Darts is all about sportsmanship. Decide who gets to go first. The best way to do this? Have each player throw a dart and the closest to the bull goes first. From then on, alternate play or have the loser of the previous game start the next. Order! Order! If you are playing with more than two players, decide the order before you start to play. Each player can throw a dart, and the order depends on the order of closest to the bull. You can pull names from a hat. You play go alphabetically. It does not matter the order, only that you agree on it before you start playing. Respect the scorekeeper. This could be you, any of the players, or a separate person entirely. Do not hassle them or ask for advice. The opposite is also true. The scorekeeper should not distract any of the players. It’s all fun and games until someone loses an eye. When someone is throwing at the board, stay at least a few feet away from them. No one should be near the dartboard or in the throwing area. When you have won the game, you have won the game. If you double out and still have a dart or two left, you do not need to throw them. Go collect the dart(s) in the board and start a new game. The most important rule of all: have fun! There, I said it, and I will not take it back. If you follow the first thirteen rules, you will play the game as it should be played, but 13 rules seems a little unlucky. Rule 14 takes care of everything else. Remember why you are playing. Celebrate your successes and laugh at your bad luck. Follow the rules, and you cannot lose (well, you will lose, but you know what I mean). Following the rules ensures that everyone is playing the same game and no one has an advantage. Play together and have as much fun as you can. Darts is a simple game. You throw three arrows at a board, tally your score and subtract that from your total. Make sure that you hit exactly zero and do so with a double and you are done. Easy as pie. That is all there is to it. Or is it? The game of darts which you see on TV is only one of many variations. Let’s take a look at some of the most common variations, starting with the game most of us already know. The aim of the game is to hit the highest score possible on each turn. On each turn, players get to throw three darts. Each player (and you can have as many as you like) begins with three legs (three chalk marks on the scoreboard). The first player throws their three darts and tallies their score. The next player must beat or tie that score with their three darts or lose a leg. Each subsequent player must match or beat the player who threw before them. If a player throws a cumulative score of 48, then the next player must throw 48 or higher. If they throw 44, then they lose a leg. The next player must now match 44 or beat it. When you lose three legs, you are out. The last player in the game is the winner. # of players: any number. Who goes first: each player throws a dart, the closest player to the bull starts. How to score points: total the score of your three darts. Strategies to win the game: It’s simple: aim for the trebles. Also, if you only have to beat a low score, play it safe and aims for part of the board that are not “hit or miss”. So, instead of going for the “5-20-1” area on the top of the board, aim for the “11-14-9” section on the left of the board. Cricket is an exciting game which lets you play with a lot of strategies. The aim is to close a number and then score points on it before your opponent closes it. The only numbers in play for Cricket are 20, 19, 18, 17, 16, 15, and the bulls. Each player gets to throw three darts on their turn. To close a number, you have to hit that number 3 times. Hit a single, and you hit the number once. Hit a double, and you hit it twice. Hit a treble, and you hit it thrice. This means that you can close a number with three singles, a single and a double, or a treble. Once it has been hit three times, it is closed. You can close numbers in any order. Once a number is closed, you can begin to score points, if it is still open for the other player or team. If you have closed the number and your opponent has not, then any time you hit that number, you score points. You score the numerical value of any single, double, or treble. If you have closed 20 and your opponent has not, you would score 20 for a single, 40 for a double, and 60 for a treble. Once your opponent closes the number, no more points can be scored. The bull counts as 2 hits and the outer bull as 1 hit. Once all the numbers have been closed by both players, the player with the highest score wins. Who goes first: throw one dart each at the bull. The closest player goes first. How to score points: close a number and hit it while your opponent has not yet closed it. Variants: you can play without points if you want a friendlier experience. You can choose to move from 20 to 15 and then the bull in order, for more challenge. You can also add more numbers to lengthen the game (like 14 and 13, etc.). Close a number quickly if your opponent is scoring in it. The aim in this game is to work your way around the dartboard in numerical order. Any number of players can play this game. Each player has to work their way around the board from 1 to 20. On your turn, you get to throw three darts. If you are on number 1, you must hit any part of 1 to move on. You can hit the single, double, or treble. Once you do, you move onto number 2. The aim is to hit every number in the least amount of darts. The first person to hit the 20 is the winner. Are you starting to see a pattern in the icons? Who goes first: each player throws a dart. The closest player to the bull goes first. How to score points: no scoring. First player out wins. Variants: You can add doubles and trebles. Each player must hit a single, double, and treble in each number before moving on. You can add the bull in at the end. After hitting the 20, a player must hit the bull to go out. You can also add the bull to the start. A player must hit the bull before moving onto number 1. This is a great game for practicing your aim. 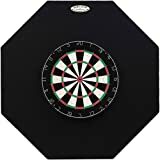 It is also great for practicing darts in single player and count how quickly you can go round the board. Shanghai consists of seven innings. On inning 1, you can only throw at the 1. On the second inning, you can only throw at the 2, and so on. Each turn consists of three darts. Only the number corresponding to the inning is scored. If you are on inning 1, a single 1 counts as 1 point, a double as 2 points, and a treble as 3 points. Any darts thrown outside of the 1 do not count. On inning 2 the 2 is scored as normal and any darts thrown outside of the 2 are not scored. This continues with the corresponding numbers up to the seventh inning. There are 2 ways to win. If you have the most points after the seventh inning, you win the game. If you hit a Shanghai, you also win. A Shanghai is when you hit a single, double, and treble in the same inning. So, if you are on inning 1 and hit the single, double, and treble, you automatically win the game. Who goes first: each player throws a dart. Closest to the bull starts. How to score points: singles, doubles, and trebles are scored as they normally would be. Variants: darts can count as 1 point for any single, 2 for any double, and 3 for any treble, no matter the current inning. Strategies to win the game: if you have the chance of a Shanghai, go for it. To begin, each player throws a dart at the board with their non-throwing hand. Only these numbers are in play. Write each player's name on the scoreboard. Beside their name, write their number and mark three lines to denote three lives. On each turn, you get to throw three darts. You must first become a killer. To do so, you need to hit the double of your number. Once you are a killer, you can kill other people. To do this, you must hit their double. Every time you do, you erase a life from beside their name. Once a player has lost all three lives, they are out. The last player remaining is the winner. "Please don't try this at home"
How to score points: only doubles are scored. Strategies to win the game: do not hit your own double once you are a killer. Team up on stronger players. That’s the short description of the 01 games. It is the most common variation of darts and the variation which you will see on TV. This is also the most common variation for tournament play. It is by far the most well-known dart games and the one most people pick up when starting. However, it is not necessarily that suited for beginners. 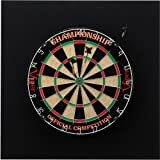 Having to “double-in” and “double-out” can be hard, and if you’ve just gotten a dartboard there are other games we recommend instead (such as cricket, legs, and shanghai). (These are also much better party games). So with that out of the way, here’s how to play the 01 games as well as strategy on how to win the game. The person to reach zero first is the winner of that game (or leg). Three legs usually equal a set. Win two or three sets to win the match (you can agree on the number before you play). You have to reach exactly zero. Go under zero, and you are reset to the total you had before you started throwing your set of three darts. Reach 1 point, and you have to reset too (you cannot go out on a double if you only have 1 point). The bullseye counts as 50 points; the outer bull is 25 points. Who goes first: each player throws one dart; closest to the bull starts. How to score points: In 301, you must 'double in' before points can be scored. In 501, all scores count. Variants: you can start with different total scores (e.g., 701, 1001, 1501). Strategies to win the game: Go for high scores when your total is high (e.g., treble 20s). Think about the double you leave yourself on. If you are left with 32 points, you are aiming for double 16. If you miss the double and hit the 16, you are left with 16 points. You can now aim for double 8. If you leave yourself on an odd number, there is usually no double to go out on (though you can go out on the bull (50 points)). This game is more challenging and not well suited for beginners. In competitive play, it is more suited to professionals. Each turn consists of three darts. There are only certain numbers in play: 20, 16, double 7, 14, treble 10, and the bullseye. The numbers are played in that order. On the first turn, players are aiming for the 20. This can include the single, double, and treble. The play then moves onto 16 and so on. Each player gets three darts for each number. Points are cumulative. If on your first turn, you hit three single 20s, you would score 60 points. If at any time, you miss with all three darts on your turn, your score is halved. 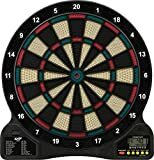 If you hit 60 points on your first turn and missed the 16 with all three darts on your next, your score would now be 30. "Half a lemon sounds good, thanks"
Who goes first: each player throws a dart at the board. The player closest to the bull starts. How to score points: hit the numbers in play (20, 16, D7, 14, T10, Bull). Variants: use an easier selection of numbers for beginners. Strategies to win the game: play as often as possible and practice hitting the areas in play. When it comes to darts, there really is no right and wrong way to grip the dart. Whatever feels most comfortable and gives you the greatest accuracy is the correct grip for you. Having said that, there are some things which you can do which may improve that comfort and accuracy. There are times where you do not know what will work until you try it. We are here to share some advice on your grip and how to get the most accurate throw. Without further ado, let’s get to grips, ahem, with grip. Take a dart in your hand and hold it as if you are going to throw it at the dartboard. Is the tip pointing up? It should be. If you were to take a dart and hold it horizontally with the ground, the tip would point directly forwards. When throwing it towards the board, the dart should point towards the board but also slight upward. A downward facing dart is not going to be accurate. One tip we can give you is to check the position of the tip at the time of release. At the moment you let your dart go, is the tip pointing up as opposed to down? Things will start to look up when you dart is pointing up. When you hold the dart, are you thinking about how you hold it? A dart should not be held too tightly or too loosely. Think about holding a chip in your hand. Try that next time you are holding a dart. Too loose and the chip falls to the floor. Too tight and you crack the chip. Either way, the chip is useless for dipping. Have a relaxed yet firm grip of your dart. When you are holding your dart, are your fingers curled into your palm? Most of us will hold a dart between our thumb and two fingers. What happens to the other two fingers? If your fingers are curled into your palm, you are not going to get the best throw. Your free fingers should be open and loose. Imagine holding a cup of tea in a posh restaurant. You want your pinky and other finger sticking out freely. Open fingers mean more relaxed muscles which will result in a more open, free, and fluid throw. This type of grip will also help you to keep the dart pointed up. Where is your dart’s center of gravity? Take a dart in the palm of your hand. Feel where the center is. You can also try and balance the dart on a fingertip (if you have the skills). You should be gripping your dart around the center of gravity. Under no circumstances should you be gripping the dart on the shaft or be touching the flight. There is no magical spot to grip the dart so experiment with your hand position. The center of gravity is a great place to start. It takes a lot of practice and time to master the correct throw. Follow our tips but do not be afraid to experiment with your hand position. The best grip is the one which feels the most comfortable and gives you the best scores. How much can your throwing stance influence your game? And, if you can stand it, I have some tips for you. If you can stand it! Okay, I’m done. Your stance aligns you when it comes time to throw your darts. If you stand straight, then you are going to throw straight. A consistent stance means a consistent throw. Here are our top tips for achieving the perfect stance. Consistency is important. The best place to start is by lining yourself up with the dartboard and finding your center. Should be easy, right? Just find the center of the throw line and place your foot there. Well, how many bar workers do you think care about centering the throw line exactly? My guess is not many. 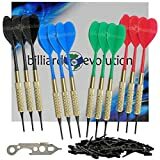 When it comes to a professional setup, you can be sure that the throw line is going to be centered, but not so much at a bar or a friend’s house. Move to the throw line and find the center visually. Where is the spot that lines up with the center of the board? Memorize or mark that spot. Now, when you step up to the throw line, you can place your foot on the center spot. How do you stand and throw your darts? You may see a lot of beginners stand with both toes pointing forward on the throw line. This stance is not going to do you any favors. The best way to stand is with your throwing side pointed towards the board. If you are right-handed, then stand with your right foot on the throw line and pointed towards the board. Your other foot should be behind and facing sideways. 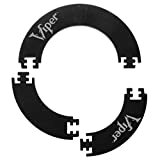 This keeps your body aligned and minimizes any movement when you are throwing your dart. Keep your feet shoulder width apart, and you are good to go. Or, good to throw. You have your stance, and you have your center. Next, you need to find your angle. Most darts professionals agree that standing with a sideways stance is best. Your torso should be at 90 degrees to the board. When your throwing arm is pointing at the board, your torso should be facing sideways. This may take some practice, and you may find that you are standing somewhere between a 45-90 degree angle. Start with what feels most comfortable and try and work towards the 90-degree angle. You are probably not going to fall over when you are playing darts (unless you have had one too many beers), but your balance is still critical. You want to distribute your weight evenly between both feet. Your feet should be shoulder width apart. Your front foot should be flat on the floor. You can lift the heel of your trailing foot if it provides you with more balance. It is important to find balance in your stance so that you do not move when you are throwing your dart. A good way to think about it is the 80:20 rule. 80% of your weight should be in your front foot. The front foot bears the weight, and the back foot steers the ship. You can lean slightly on your front foot as you throw but be careful not to lean too much. When you throw, you need to be calm. A common mistake is moving your body too much when you throw your dart. The motion should flow through your shoulder, and you should not find yourself lunging. Your shoulders should remain steady, and your spine should always be straight. Where is the motion coming from? Your arm above the elbow. This is the part of your body which should be moving. The remainder should stay still and calm (a little movement is fine). Never lunge. That extra thrust is not going to add anything to your throw and will usually take away some of your accuracy. Follow our simple steps, and you will be throwing more accurately than you ever have before. It does not take much to gain a great throwing stance. Strive for consistency, and you will only improve. What is the most important part of your game? Accuracy is a big part of it, but accuracy is only part of something bigger. With great accuracy comes great consistency. Consistency is what we strive for, and this is not only in our accuracy. We also strive for consistency with our outs, our stance, out grip, our throw, and so much more. When you are focused on accuracy, you are focused on improving your entire game. So, without further ado, what can we do to improve consistency? If you cannot hold the dart correctly and consistently, then you are not going to be able to throw it consistently. When you are thinking about gripping the dart, you want to be gripping it in the same way, every time. Here are our top tips for gaining a consistent grip. Hold the dart between your thumb and first two fingers like you would with a pencil. Have a relaxed yet firm grasp. Think about holding a potato chip. The thumb is for support; the fingers are for guiding the dart. Keep your other fingers loose and not curled into your palm. Find the ridge on your dart where you grip it and strive to grip it at the same point each time. Now that you have the grip mastered, you need to master a consistent stance. If your stance changes, then the same grip is not going to matter. Here are our top stance tips. The throwing foot of your dominant hand should be forward in your stance. Your feet should be between 45-90 degrees in relation to the direction you are throwing in. Your weight should be mostly on your front foot. You can raise your back foot slightly for balance. The weight should shift to your front foot during your throw. You should not jerk forward when you throw. The main movement will be from your elbow down. Lock your knees and only bend them slightly if needed. If your stance is consistent and your throw is too, that goes a long way towards maintaining a consistent throw. Before you throw, you want to make sure that your arm is set up to throw the dart. I know that you want some more tips, so here they are. Your upper arm should be raised; it can be parallel to the floor. Your dart should line up with your face. You should be able to look through the dart to the board. Line up your dart and aim for a specific target. Once you have your arm in position, it is time to throw the dart. A lot of consistency has gone into getting us to this point, so it is only fair that I am consistent too. Here are some more top tips. The movement of the throw should be from the forearm and wrist. Movement in your upper arm and shoulders should be minimal. You do not need to release with a lot of force. Release with a fluid motion. Move your forearm quickly to generate enough force. Flick your wrist in tandem with your forearm movement. You have set up your arm and achieved consistent motion. The only thing to do now is concentrate on the follow-through. And, we are going to follow through with some more tips. Make sure to follow through. Make sure to follow through (it was so important that we had to mention it twice). Extend your arm after release. Follow the natural movement of your arm. A few simple tips and you can achieve consistency in your throw and, dare we say it, greatness. Take the time to master consistency on each of the areas. They are the building blocks of a consistent throw. One last tip for you. Doubling out is one of the most important aspects of darts. In a regular competition, you will be playing 501; a game where you have to double out. If you get the chance to play 301, then you will have to double in as well as double out. With all ’01’ games, you need to double out (unless you are playing by different rules). A great skill to have as a dart player is the ability to know which numbers to hit to leave yourself on the best double. It can be tempting to go for the treble 20 when you have a high score and then worry about the double later, but this can give you less chance of getting on a double. For example, if you are on 94 points, it can be tempting to hit a treble 20 and then double 17. This would be a fine way to go out, but if you miss the double 17 and hit the single, you are in a little more trouble and cannot go out on your next dart. If instead, you went for treble 18, then you would leave yourself on double 20. In this example, you have another out if you hit the single 20. You can now go for double 10. One of the key things in darts is leaving yourself a safety net. You always want to leave yourself on a double which leaves you on a double if you hit the single of that number (that sounds confusing). This means always leaving yourself on an even-numbered double. Of course, it can be tempting to leave yourself on your favorite double, but you should be practicing all doubles just in case. The ultimate double to leave yourself on is double 16 (32 points). If you hit the single 16, you leave yourself on double 8, then double 4 if you hit the single 8, double 2 if you hit the single 4, and double 1 if you hit the single 2. When you reach 170 points, you can go out with three darts. Almost every number below that can be gotten out in three darts (or less), so that is when you should be thinking about your out. If you have 170 points or less, you should be thinking about your out. The more you play, the more you will memorize the common outs. The other thing you can do is have an out sheet by the dartboard (or just go ahead and memorize all the possible combinations). With any game, especially those on the grand stage, there are nerves. 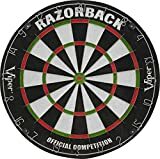 With a game like darts, with the involved accuracy, you can get moments of nerves and tension as you try to hit that small area of the board. Miss, and you give your opponent a chance to win. Even worse, you leave yourself on a harder out. Nerves get the best of us at some point in our lives. Darts is no exception. So, what can you do about it? Never fear, we are here to help you. All games are mental, to an extent. Master the mental game, and you will master the physical game. Here are our top tips for achieving darts greatness. You have three darts in your hand. You have one double to hit. You have everything to lose. Are we making it sound dramatic enough? "No please make it even more dramatic!" You may not think it now, but when you are on the throwing line in this exact situation, then you are going to feel tense. So, what do you do? When your knees are feeling weak, and your hands are shaking, it is not your body which is giving you trouble; it is your mind. And, just so that you do not feel bad, the professionals suffer from it just as much as the novice player (often more so). So, what is the difference between a pro and an amateur? The answer is their mental game. Follow these simple professional tips, and your mind will master your body. What is worrying about losing going to do for you? Are you suddenly going to become a better player when you worry? The answer is no. Are you going to become a worse player? The answer is yes. In short, stop worrying and just play. When you just play, you stick to your game. It does not matter if you are on the cusp of destroying your opponent or on the cusp of a loss. If you play your game how you usually play it, you are going to play your best. Negative thoughts have a way of creeping into our minds without us being able to stop them — kind of like that one Uncle who always turns up at Christmas. Well, we may not be able to stop them, but we can usher them out (easier said than done when it comes to the uncle). If you have seen the movie Happy Gilmore, then you know about the Happy Place. If you have not, then I am about to explain it to you. Your happy place is the place you love being the most. Think of where you are your happiest. Close your eyes and imagine yourself being there. Immerse yourself in that place. When you are there in your mind, squeeze the fleshy part of skin between your thumb and forefinger. Stay in your happy place for as long as you want. Now, when you get into a ‘bad place’ in your darts game, go to your happy place. Close your eyes if you have the time or squeeze the flesh part on your hand to remind yourself. It may sound like hocus locus but, trust me, it works. This technique has been used by sports professionals for years. When you have some spare time, imagine playing a game of darts. Think about the perfect game. See where the darts are going. Envision yourself throwing those darts and the darts hitting the spot. Think back over all the times you have hit the perfect shot. Now, when you step up to the throwing line, think about your shot and how perfect it is going to be. You are not going to hit the perfect shot every time, but confidence will do wonders for your game. It may sound like a cliche, but it is true. You may find yourself well behind in a game. It can be easy to throw in the towel. The best tip we can give is never to give up. You are not going to make an amazing comeback every time but you will occasionally. It is amazing how often people get distracted by the person chasing them and are thrown off their game. The better you can play when you’re behind, the more pressure it puts on your opponent. The more pressure, the more likely they will slip up. All it takes is a small gain for it to begin to snowball. You should also be careful when you are in the lead. Never give up in that situation too. Do not think you have it in the bag. Always play as if your life depended on it. Our tips are simple. They are easy to follow and can be done with minimal effort on your part. Take the time for yourself and practice the mental game the next time you are playing solo. A little mental preparation can do a lot more for you than throwing a few thousand darts at the board. The best darts players in the world use the best darts in the world. It does not matter which dart board you use; your aim is not going to be improved by it alone. 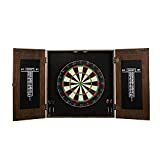 You may have boards which hold the darts better or give you more room in the trebles for darts to sit, but it is the darts which will determine how good you can become. The best darts in the world have tips sharp enough to penetrate a sisal fiber (or any other type of dart board) without damaging it. 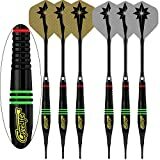 They have flights which will help to keep your darts accurate. They are durable and comfortable. They will become an extension of your hand. Below the table is our list, starting with our number one. These are professional darts. 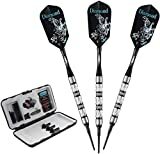 Novices are going to find a lot to like about these darts, and professionals are going to see an improvement in their game when they use these darts. 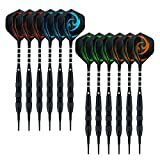 These are great darts for novices and professionals. They are sleek and slim, giving more grouping for higher scores. They are also heavier than most darts, but still, have a lot of control and accuracy. 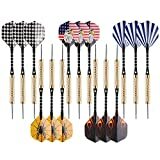 These are great darts for beginners. 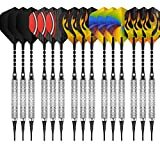 If you do not yet know what darts works best for you, then this is a great set for you to be able to try out a lot of combinations before moving up to a more professional set. We love these darts, especially the rotating flights on impact. When you throw your dart, and it hits the board, the flights will continue to spin the dart, making it dig in deeper or spin past any wiring or other darts it may have come into contact with. This results in fewer bounce outs and a more consistent score. Over time, your scores will naturally be higher without you having to change your game at all. Talking of rotating, the locking holes on the shafts allow you to rotate the shaft onto the barrel for a tight fit which will not come loose when your darts are thrown. A shaft and barrel which are not tight can cause the dart to move in the air. With a locked dart, you are ensured of a perfect flight every time. The grips also add to your consistency and accuracy when the darts are in flight. The knurled vends and deep grooves allow your fingers to find the same position on the dart every time you throw it. By throwing the dart from the same place each time, you are throwing with consistency and can improve your accuracy over time. These darts are going to improve your scores. If you like heavier darts, then these are the ones for you. 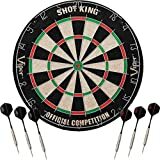 They may take a little getting used to if you are not used to throwing heavier darts but they can do wonders for your accuracy, and they prevent many bounce outs. With 95% Tungsten, you know that you are getting a quality barrel which is going to hold up over time. The eleven hand-painted grooved rings in the barrel not only look great but give a lot of functionality. They provide great balance which translates into a more even flight, and they also add consistency to your throws. As you throw, time and time again, your fingers will lock onto a specific part of the barrel allowing you to throw from the same position, again and again, hitting the board with more accuracy. The barrels are center-weighted. This means that you get a better and more consistent flight when you release the dart. The darts are also easier to control, even with the extra weight. We like that this darts set comes with a lot of extras. 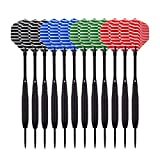 You get six shafts, three flights, three bonus alloy flights, a point sharpener, and a dart tool for tightening. All of these are then stored in a neat aluminum case which will protect everything. We like how accessible these darts are. They are for novices and professionals alike. When you throw the darts, you will not only like how they feel, but you will also be surprised by the quality of the flight and your improved scores. These are great looking darts. From the Tungsten barrels to the eye-catching flights, these darts look professional. They act professionally too. The barrels are 98% Tungsten making them sturdy and durable. The grooved Tungsten barrel also means better grip. 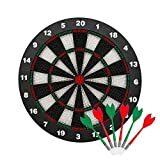 When you throw the darts, they will leave your hands in a balanced and stable manner, flying towards the board without moving away from where you threw them. The flights are high-quality too and will keep your dart on a true path as it flies towards the board. When it hits the board, the steel tips will dig in and hold, preventing bounce outs. You get three extra flights with this set, along with three extra shafts. A sharpening tool and a flight saver will keep your darts in tip-top shape for a long time, and the carry case will protect them, no matter where you go. You have lots of extra flights and shafts. 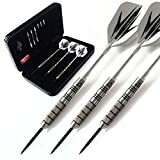 These darts are built to last but, should something happen to the darts; you have all the tools at your disposal to fix them. We love the flights on these darts. With the wolf image, you can look, and feel, as if you mean business. The 80% Tungsten and 20% nickel in the barrels give you a balanced and consistent shot. The grooves in the barrel further this by giving you a consistent grip before you release each dart. 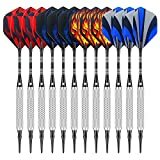 The profile of each dart is slim, giving you better grouping and higher scores. When you lock the shaft to the barrel, you ensure that they are not going to come loose and shake as the dart is thrown. Even bounce outs which hit the floor are not going to dislodge the shafts from the barrel. 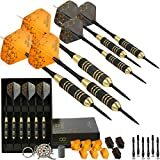 This is a darts set for those who do not yet know what darts are for them. With this darts set, you can switch out multiple flights, shafts, barrels, and points to find the perfect setup for you. You can switch between heavy and light darts or long and short darts. Everything is customizable until you get the darts which are giving you the best performance possible. The flights come in different designs and also different shapes. The combinations are almost endless (but, of course, they do have their limits). We like the addition of rubber o-rings to help keep the shafts in place when you attach them to the barrels. We also love that you have a dart sharpener to keep your darts sharp and a multi-tool to take the darts apart and put them back together again — a great set of darts or experimenting with. This is an excellent set for beginner or intermediate players. You will learn a lot from the book, and the darts have enough quality for you to improve your game through practice. 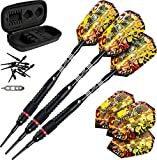 ​You get two sets of darts when you buy this set, so already you have enough for two players to play. The darts have been expertly crafted to bring you a great compromise between value and professionalism. 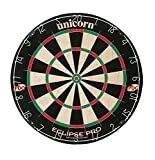 The points are impact resistant, being able to stick in the dartboard with reduced bounce outs and protection against damage. The dart sharpener will also help to keep the tips sharp and improve on the piercing ability of the darts. The innovative carry case has a magnetic closure and cushioning on the inside to protect and cradle your darts. You also get a free book with your purchase which will detail different ways you can play and tips for improving your game. 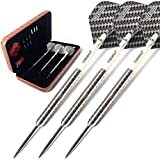 We love this set as a gift for anyone who is just starting out with darts. 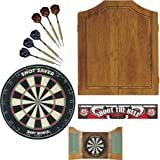 Pair it with a board for a complete set or to accompany a board which comes with beginner darts. This set is perfect for beginners. You get two sets of darts, so you are ready to play with a friend as soon as they arrive. You also get everything you need to keep your darts in excellent condition. 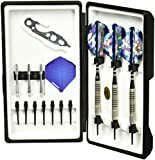 The multi-tool, shaped like a mini dartboard is cute and useful, the sharpening stone will have your darts sharp in only a couple of minutes, the extra flights allow you to customize your set, and the carry case holds your darts perfectly. We like the addition of a free ebook (anything free is great, in our opinion). 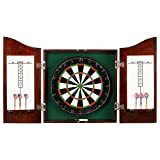 Playing darts is a great way to learn, but a little nudge in the right direction (like you will get from the book) can only make you a better player. Great for beginner and intermediate players who are looking for some customization. Would also make an excellent gift for a dart player who is starting out. 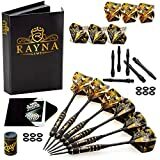 This is a great set if you like to customize your darts. You get six unbreakable brass barrels which can be combined with twelve distinct flights, twelve shafts, and o-rings to keep everything together. Everything is then contained inside a neat carry case for easy transportation and protection. The weight of each barrel is balanced finely. When you hold the darts in your hands, they will just feel right. They have the kind of quality feel that you expect from a more expensive dart. 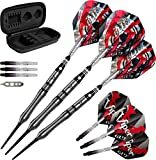 The flights also give you great stability; stability which you would again expect from a much more expensive dart set. This is a perfect set for a large group of people. Get four of your friends together, and you will have a design for everyone. 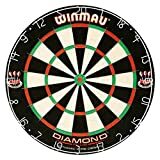 The darts are affordable but still give you enough quality for an exciting tournament or competition. 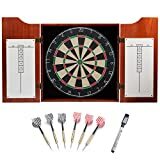 This is a great darts set for a group of friends or a family. The barrels and shafts all look the same with the flights being the difference between them. 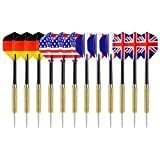 With such a varied design on the flights, you are sure to find a dart set which everyone likes. When you are putting the darts together, you will notice an o-ring which sits between the shaft and the barrel. This o-ring helps to keep the darts together so that there is no wobble when you throw them. There is enough knurling on each shaft to give you an excellent grip, translating to a great release. The flights have also been designed to improve the speed of your dart through the air while maintaining accuracy and decreasing the drag. We like that you can use this set to play in large groups or tournaments. The set is also affordable enough to buy the set for yourself and have backups to your main set. This is a great set for groups of friends or a family. The four distinct colors make it easy to organize a tournament and keep track of who is scoring. The darts come with a strong steel barrel, durable aluminum shafts, and stylish colored flights. There is also a dart sharpener included to keep your darts in sharpened condition and prevent bounce outs. Each dart is a balanced 23 grams and has grooves on the barrel to give you a better grip and more consistent release, leading to higher and more consistent scores. Great for beginners and groups. If you are organizing a large tournament, you can order the 24-pack and have enough darts for everyone to get a set. The flag flights make it a great set if you want to show your national pride. If you are from one of the countries featured on the flights or have friends from one of the countries, then this would make a great gift (for you or another). We like how these darts look and love the option to choose either the 12-pack or the 24-pack. Being 17 grams, these darts are also great for beginners. The darts are easier to throw and stick in the board well. Over time, that will lead to more success for beginners before they move up to more professional darts. 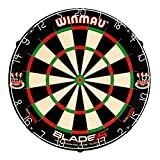 Can I use steel tip darts for an electronic board? The short answer is no, you cannot. 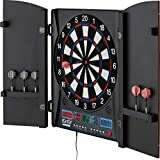 You should instead use soft tip darts for an electronic dartboard.